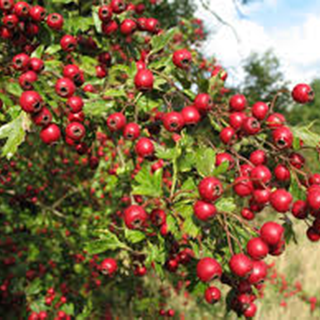 Thorny shrubs and trees from various species of hawthorn are found throughout northern temperate zones. Crataegus laevigata is the European species, but Crataegus pinnatifida is native to northern China, and is also used as a medicinal herb. This is the premier herb for treating heart-related illness. Hawthorn is commonly and effectively used on an ongoing basis on recuperation from heart surgery or heart attack and for treating degenerative heart disease, arteriosclerosis, weakness of the heart muscle and irregular heart beat. This herb regulates blood pressure and promotes a general sense of open-hearted well-being. Drink 1 cup (2 tsp herb per cup boiling water) of the flowering tops 3 times daily to improve peripheral circulation or to support treatments for high blood pressure. Alternatively, drink 1/2 cup (2 tsp of the berries per cup boiling water) up to 6 times daily for acute diarrhea or digestive upsets. The same mixture can be used as a general tonic for the heart: drink 2 cups daily. Take 20–40 drops (1–2ml) of a standard tincture of either the berries or the flowering tops for high blood pressure; best combined with other herbs as appropriate. Pulp the berries in a food processor, squeeze out the juice, and take in 2 tsp (10ml) doses twice daily for sluggish digestion and diarrhea. It can be grown from seed if planted in the autumn and allowed to overwinter in a cold frame, but is more often propagated from cuttings in spring. Plant heeled cuttings in a small pot and, once rooted, pot into 8in (20cm) pots until sufficiently established to plant out. Will self-seed. Gather leaves and flowering tops early in the flowering stage in spring, and the red berries in autumn when ripe, after the first frost.